For the first time since the preliminary findings of the dig at Amphipolis were made public in 2013, Katerina Peristeri, head of the much debated excavation project, and several members of the Amphipolis excavation team presented their findings at the annual scientific conference on archaeological work in Macedonia and Thrace (AEMTH) held at the Aristotle University of Thessaloniki. 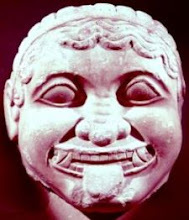 During her presentation, Katerina Peristeri reiterated her claims regarding the monument’s Thasian marble-made funerary peribolos, the Amphipolis Lion’s position on the tumulus’ top, the pebbled floor, the Sphinxes and their characteristics. She also presented a series of monuments and architectural elements from other sites which she considered to be morphologically and aesthetically similar to the Amphipolis monument, in order to support her proposed 4th cent. BC dating. Among those “parallels” were pebbled floors from several private houses at Pella and Caryatids found at the site of Svestari in Bulgaria. Ms. Peristeri also made reference to the skeletal remains found within the monument (belonging to a woman, a man, a child, and a cremated individual), the pottery finds (e.g. black glazed vessels, pointed amphoras), coins depicting Cassandros and Alaxander III and monograms of Antigonos Gonatas. The newest find was presented by Italian archaeologist Antonio Corso: several marble fragments of a frieze thought to come from the Lion’s base, found 120m. from the tumulus’ peribolos, at a site containing hundreds of burials. 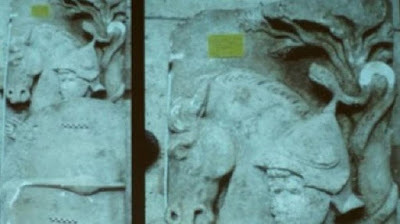 One fragment bears a relief representation of a warrior wearing a distinctive Macedonian helmet and holding a shield and a huge spear, while a horse’s head, a snake and part of a tree are also visible. According to Corso, the warrior’s representation can be identified with Alexander the Great (due to his hairstyle and posture) bearing the oversized armour of his friend and fellow fighter Hephaistion, the deceased hero. 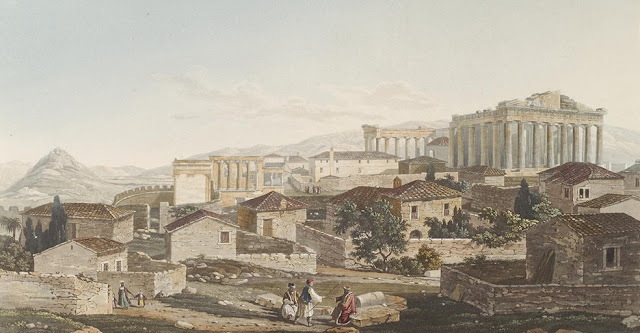 Corso’s suggestions, as well as some of the views expressed by Peristeri and her fellow researchers were not, however, accepted by all archaeologists and academics present at the conference.